Christmas is coming on like a bobsled, and I still have gifts to finish, but I stopped today to whip up a little something for you. 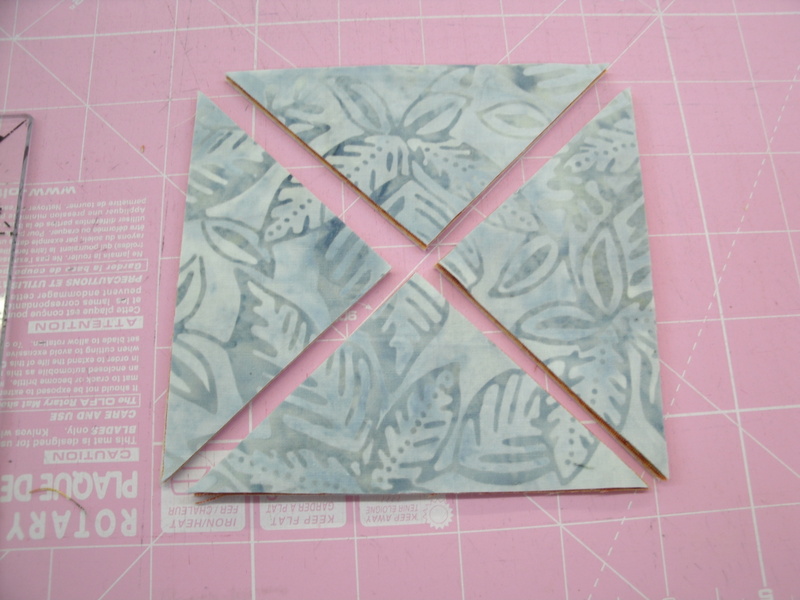 Surprise…it’s a quilt block! 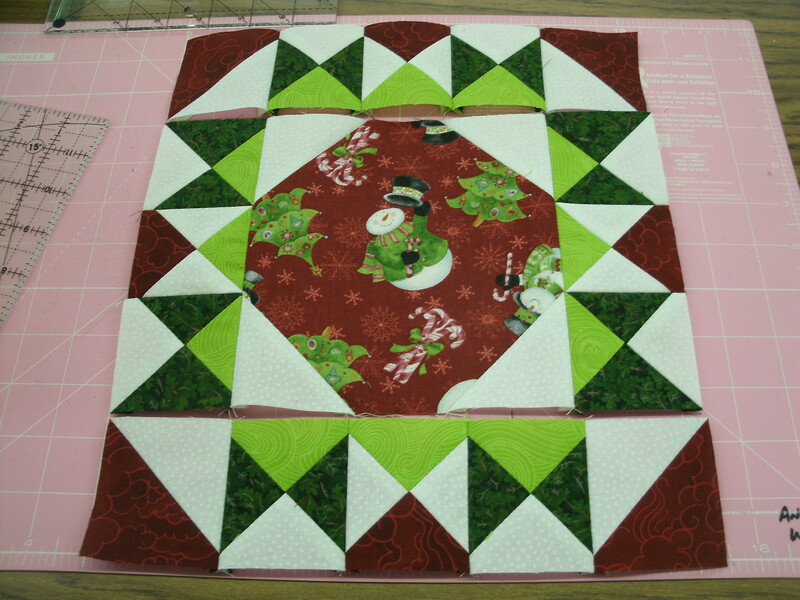 :0) It’s a 10″ (finished) block, and I called it “A Christmas Wreath”. 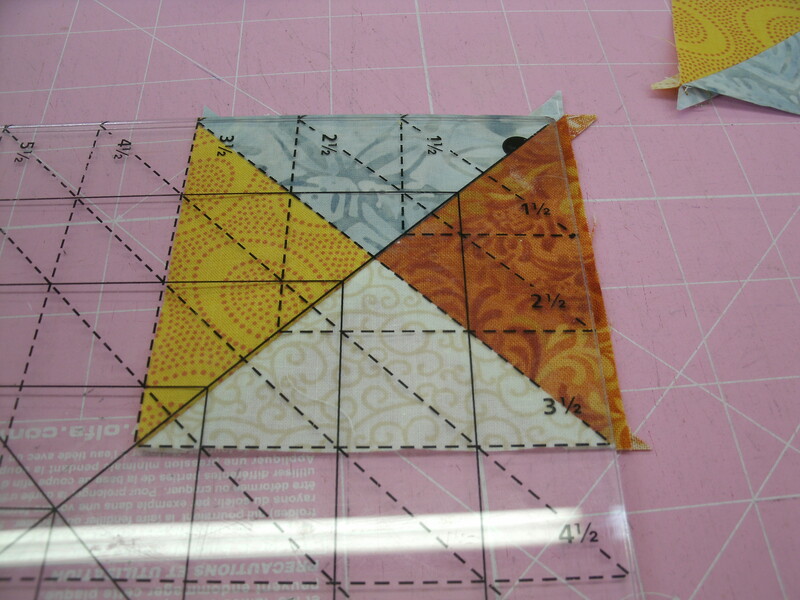 I used a Tucker Trimmer® to make the half-square triangles (HSTs) and quarter-square triangles (QSTs). If you’re not familiar with this tool, CLICK HERE for a previous post that goes into more detail on its use. The first step is to put white corners on the novelty print square. Draw a diagonal line on the back of each of your 2.5″ white squares. 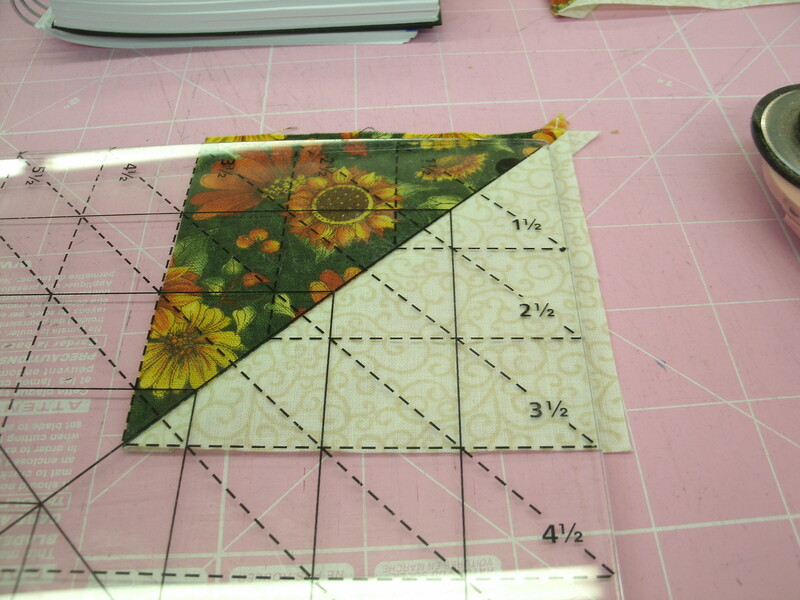 Lay a square on a corner of the 6.5″ novelty print square and sew on the line, then trim 1/4″ outside the line. Repeat with all four corners. Press the corners open. Set this center section aside. 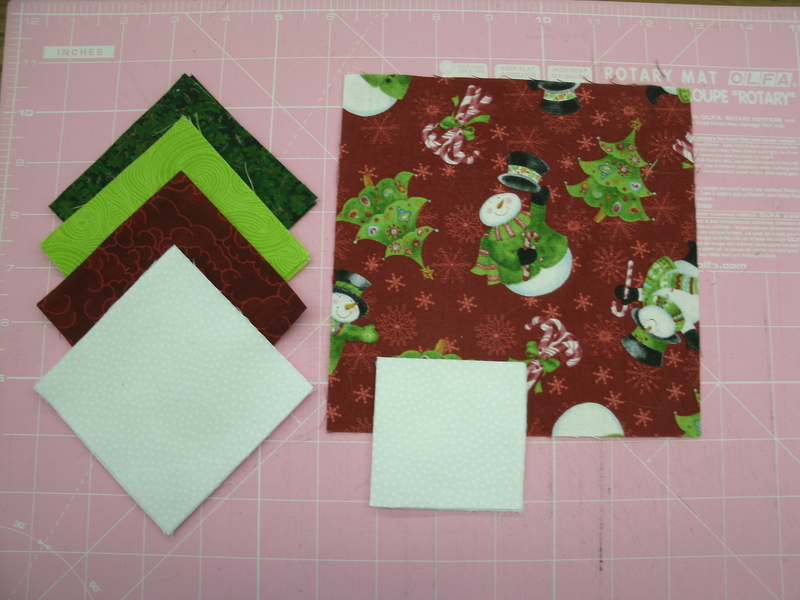 Step 2 is to make four red and white HSTs. 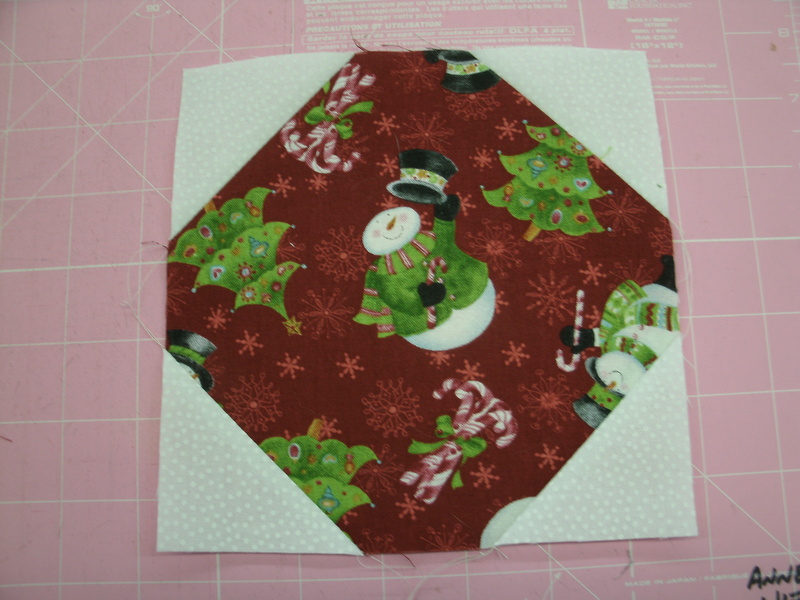 Cut two of the red 3.5″ squares and two 3.5″ white squares in half diagonally, and sew the red and white halves together. I press my seams open, but you can press to the dark side if you prefer. Use the Tucker Trimmer® to trim the HSTs to 2.5″ as illustrated. above. For Step 3, we need to make QSTs. 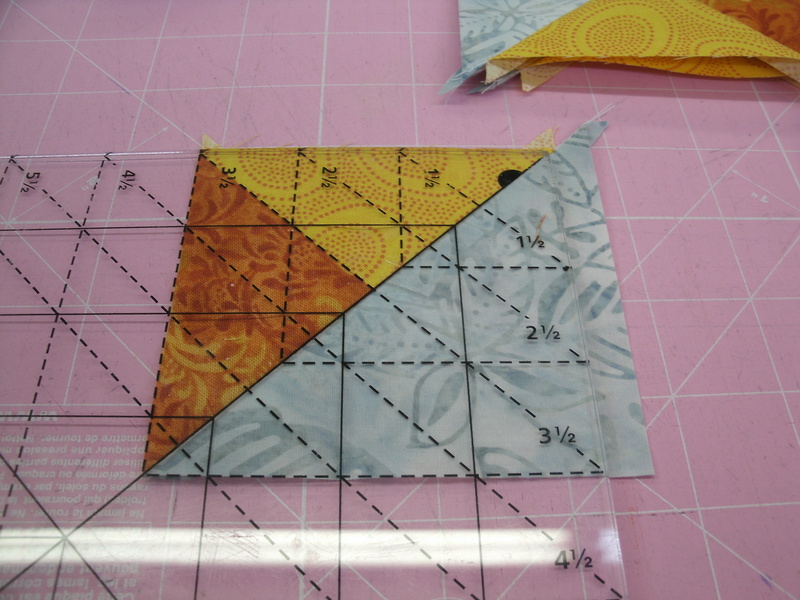 Cut all of the remaining 3.5″ squares diagonally twice. 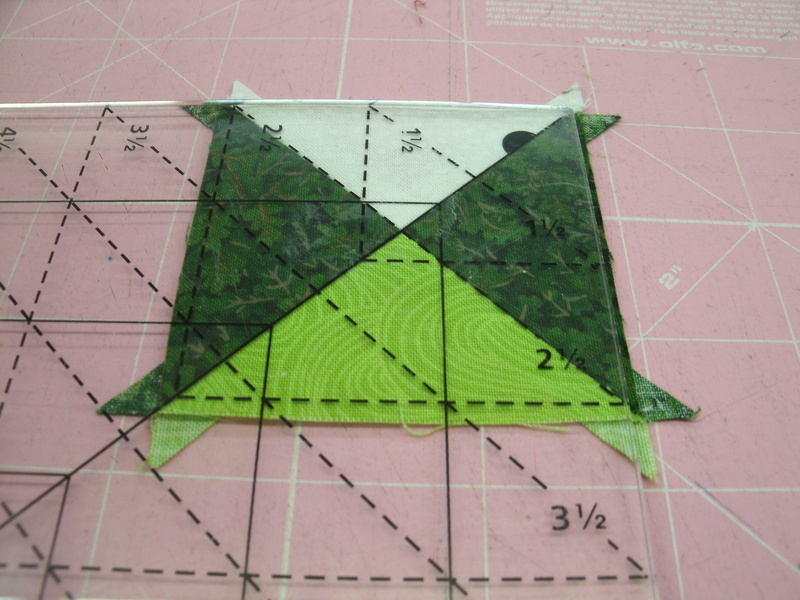 Sew eight QSTs, each with two dark green triangles, one light green triangle and one white triangle, then use the Tucker Trimmer® to square them to 2.5″ as illustrated above. 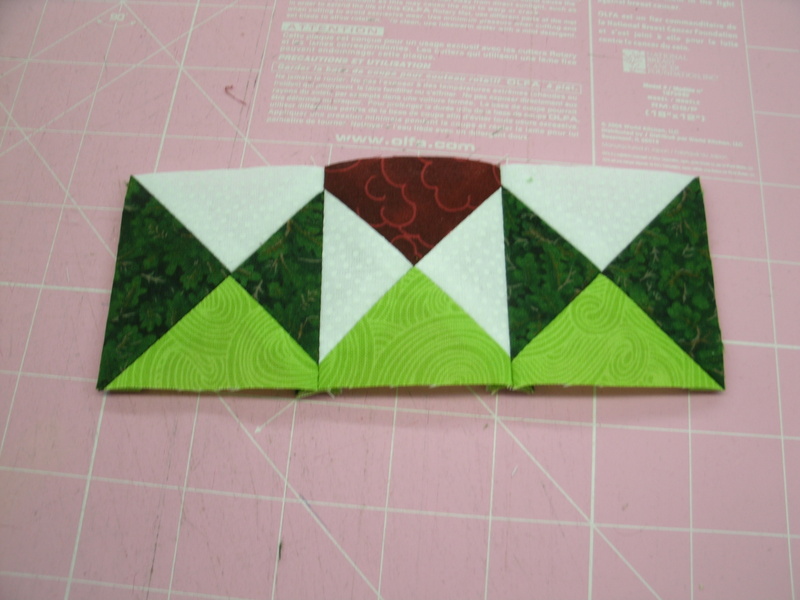 You will also need four QSTs, each with two white triangles, one red triangle and one light green triangle. Square them to 2.5″ as well. 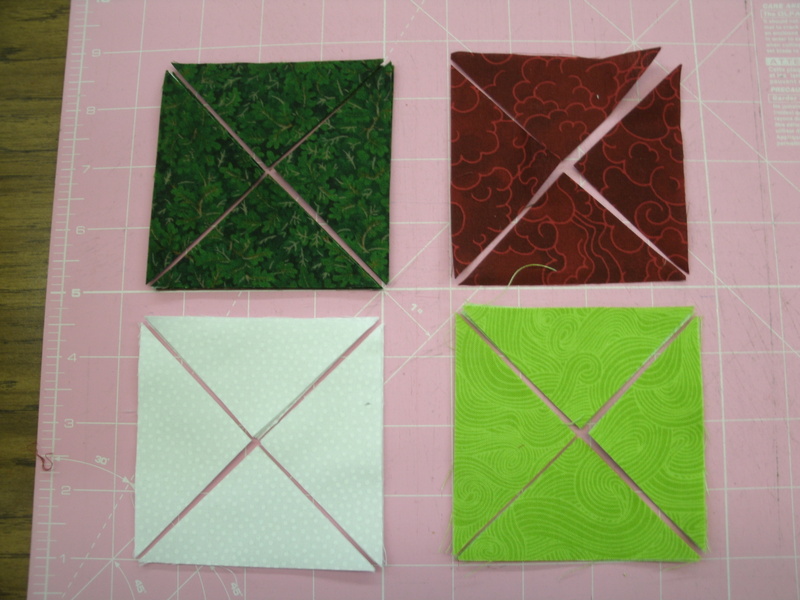 Sew the QSTs into four units as pictured above. 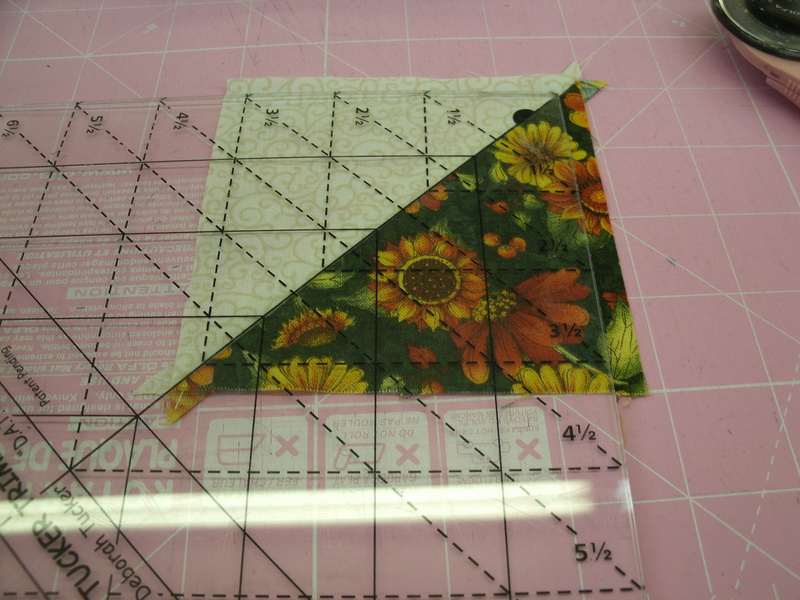 Sew two of the QST strips to the sides of the center unit. 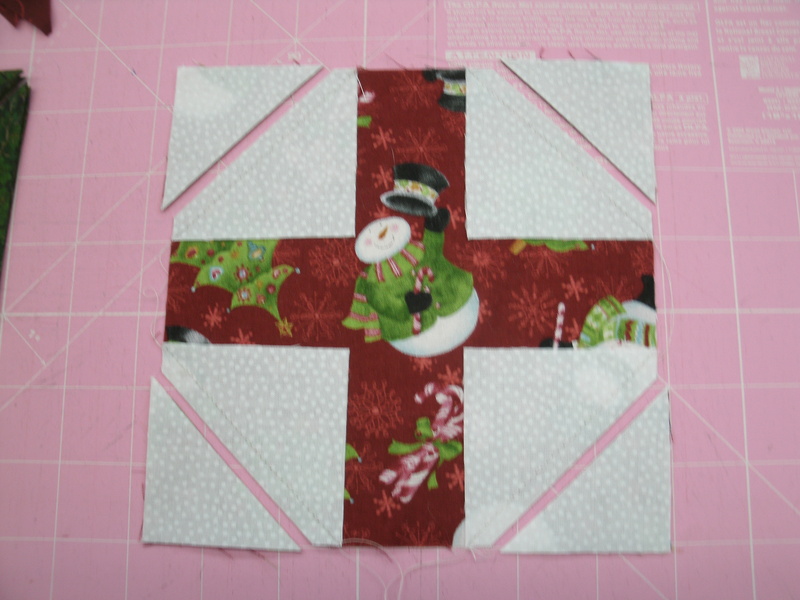 To finish your block, sew the HSTs to the remaining QST strips as shown, and sew to the top and bottom of the center unit. Of course, just because I called it a wreath and used red and green fabrics, that doesn’t mean you have to. I love autumn. Someday I hope to see a New England autumn in person, but if that never happens, I’ll be content with ours here in Montana… as brief as they can be. I recall one fall day several years ago, driving on U.S. 2 along the southern edge of Glacier National Park. The leaves (aspens, I think) were so golden they were glowing…and the sky was cloudy! 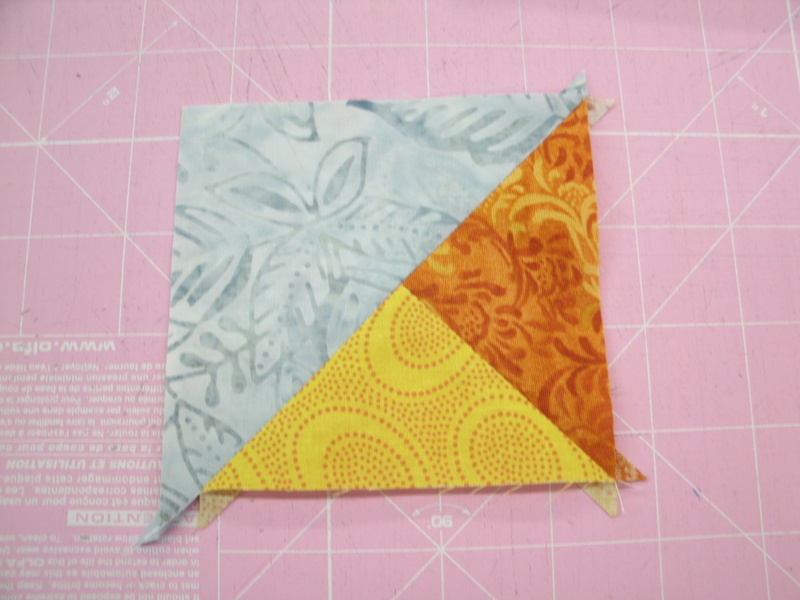 This block – which I call “Morning Star” reminds me of that moment. Materials for a 12″ Morning Star block. If you don’t have a Tucker Trimmer ™ , consider adding it to your Christmas wish list. 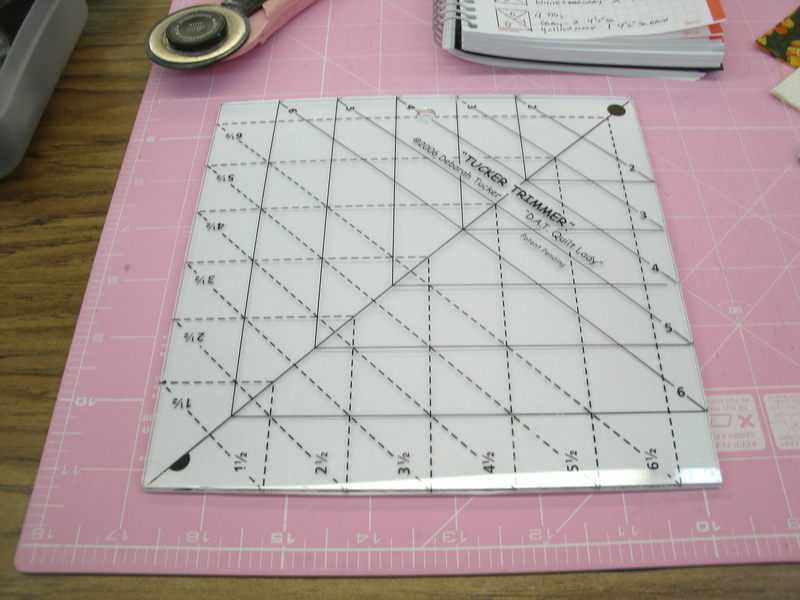 It is the handiest tool out there for making accurate half-square triangles (HSTs) and quarter-square triangles (QSTs). I’ll use it for all three units in this block. First, we’ll make the HSTs. 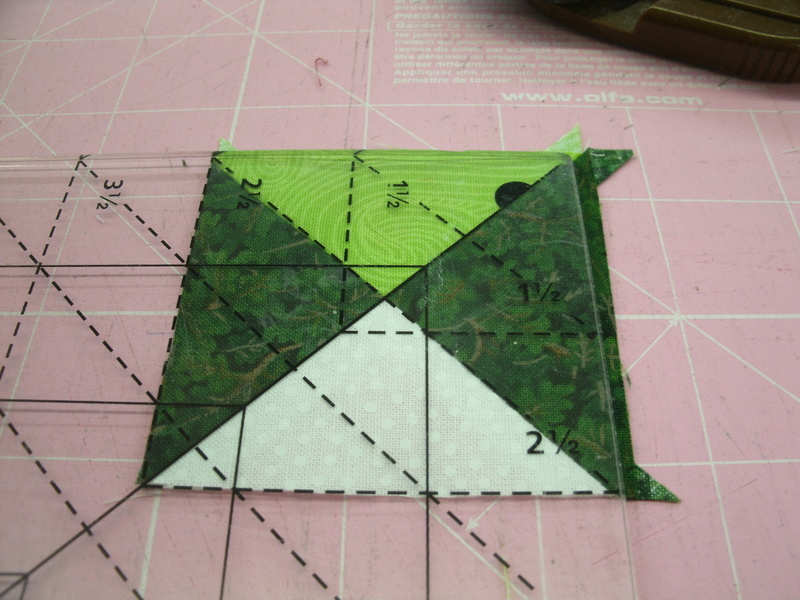 Cut the two green squares and two of the white squares in half diagonally. Sew together as shown. 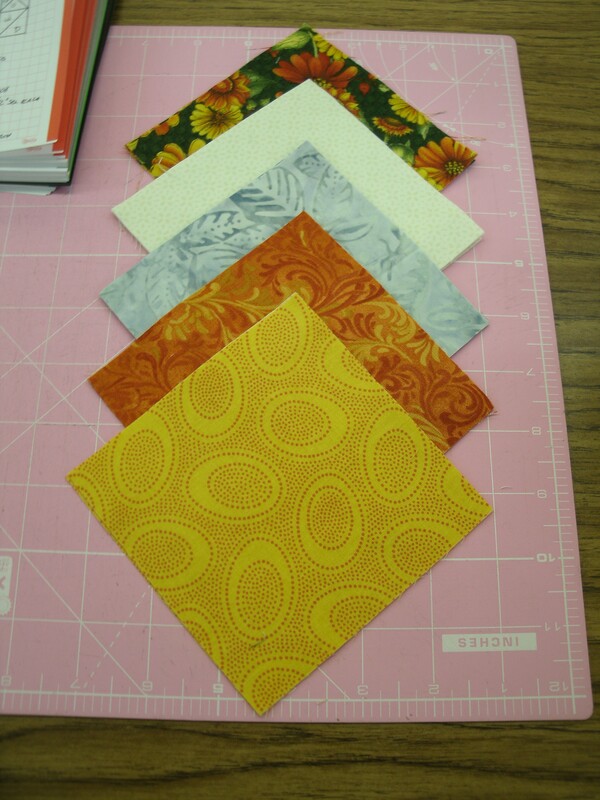 You will have four HSTs that are larger than they need to be. We use the Tucker Trimmer to trim them to size. Lay the Tucker Trimmer on the HST, lining up the diagonal line with the seam line. Notice that the left and bottom edges of the HST extend beyond the 3-1/2″ lines on the trimmer. Trim the top and right edges. 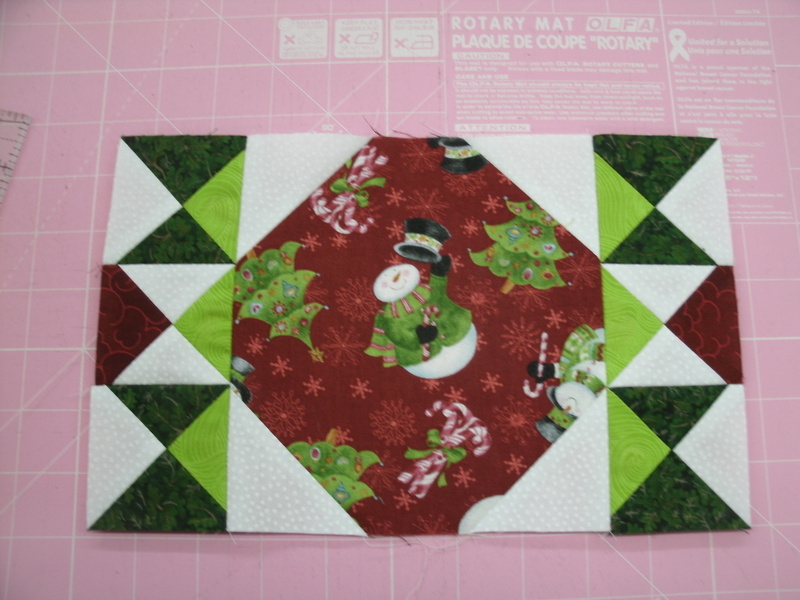 Rotate the HST (if you’ve been really good, ask Santa for a rotating mat, too), and line up the diagonal line on the trimmer with the seam line again. 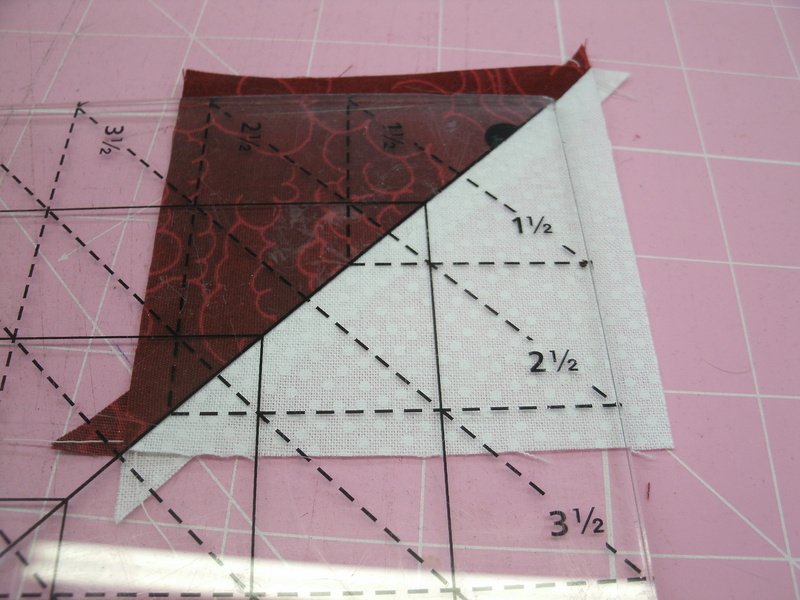 This time the edges you trimmed should align with the 3-1/2″ dashed lines. Trim the top and right edges. 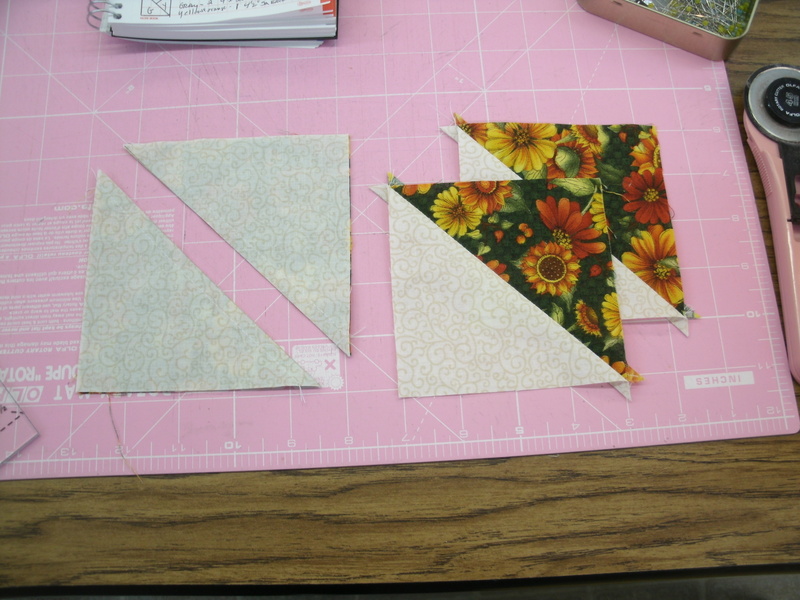 Set these four HSTs aside. Now we need to make eight QSTs. 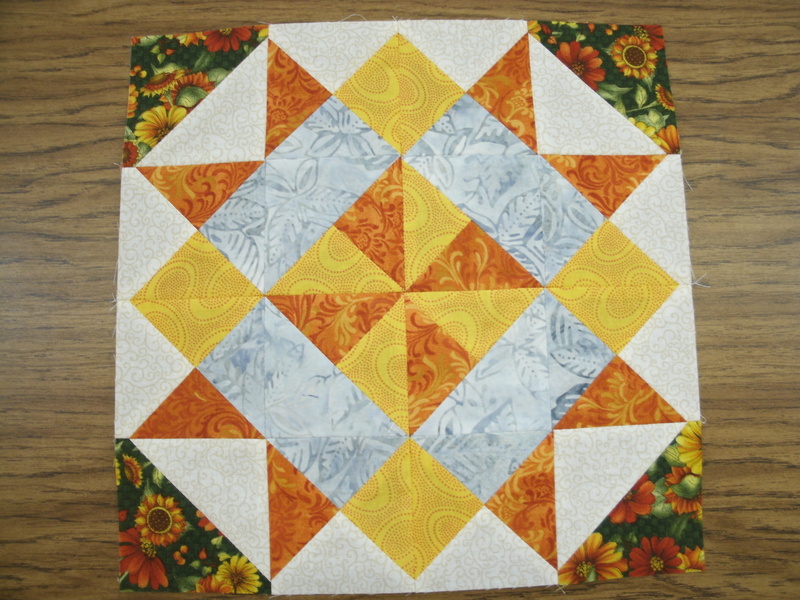 To do this, cut two gray squares, two white squares, one yellow and one orange square diagonally twice, as shown above. 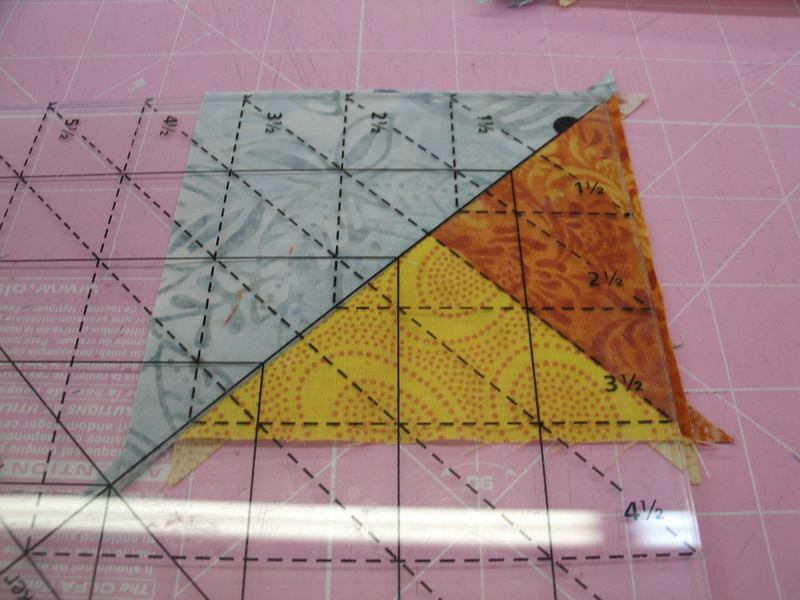 Sew all of these triangles into eight QSTs. Notice the QSTs pictured here: both have a white triangle on top and gray on the bottom. In one, the orange triangle is on the left and the yellow on the right. In the other, the yellow is on the left and the orange on the right. Make four of each. Lay the Tucker Trimmer on the QST so that the solid diagonal line is on the seam line. The dashed 3-1/2″ line should line up with the other seam. Just like we did with the HSTs, trim the right and top edges. 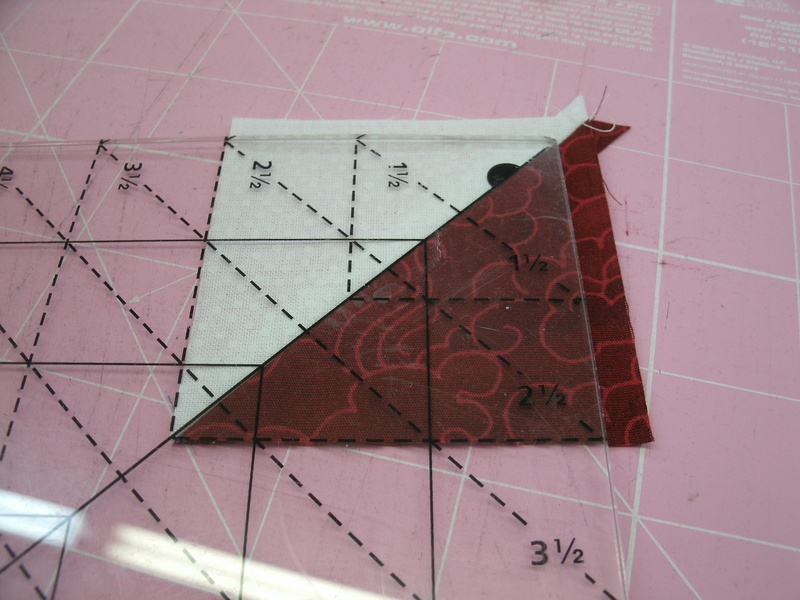 Then rotate the QST, re-align the diagonal lines with the seams, and trim the top and right edges. Set the QSTs aside. To make the final unit, cut the remaining yellow and orange squares diagonally twice, and the last two gray squares diagonally once. 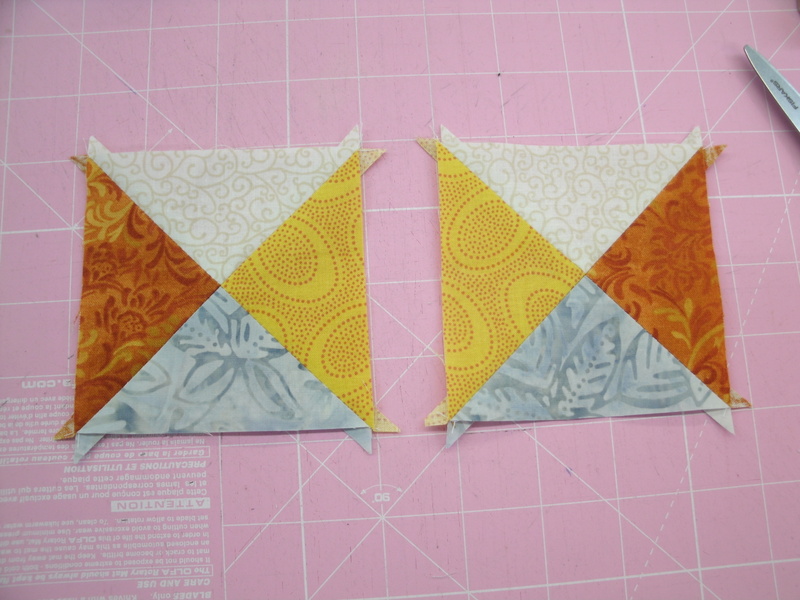 Sew together into four units that look exactly like the one in the photo. Notice that the lower left corner does not match up. That’s okay. Back to the Tucker Trimmer. Line up the solid diagonal line with the long seam, and the dashed 3-1/2″ diagonal line with the short seam. Trim the right and top edges. You know the drill by now…flip the unit around, realign the trimmer and trim the top and right edges. You now have 16 units – four of each shown above – and each one should be a perfect 3.5″ square. 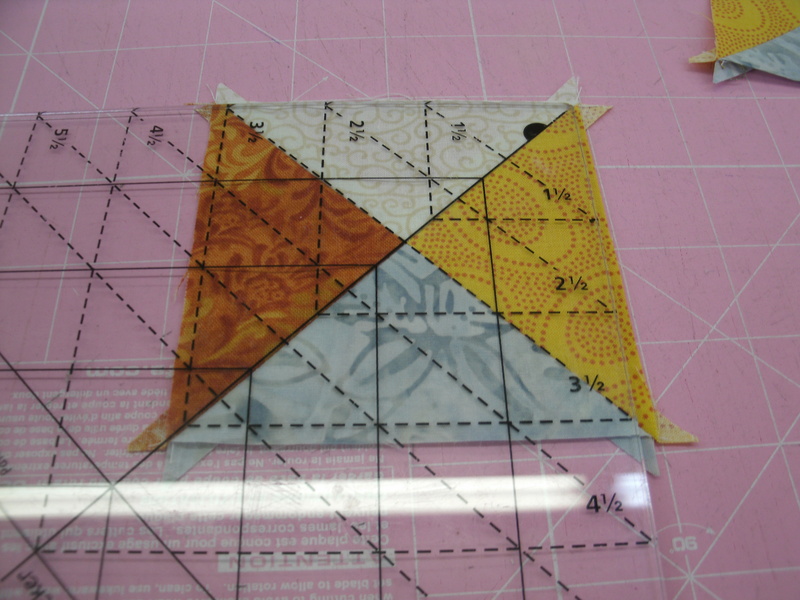 Lay them out as shown, and sew together into four quarter units. 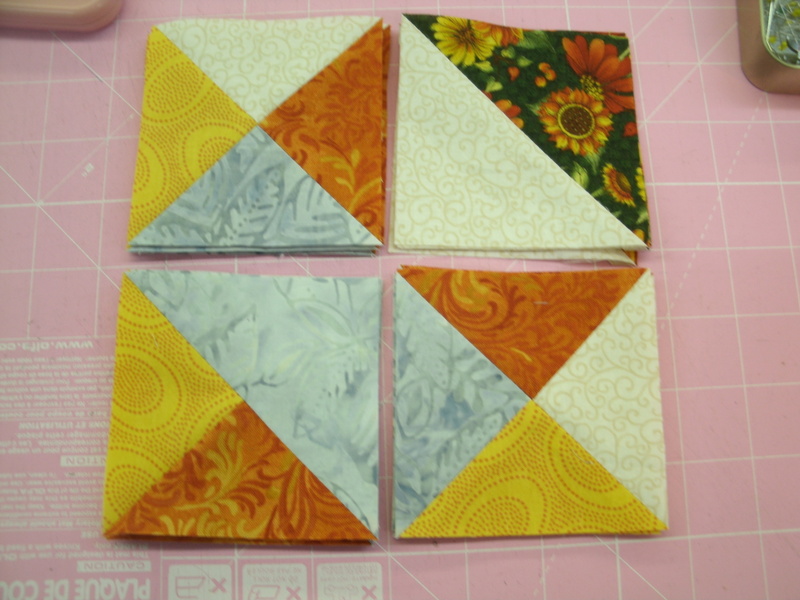 Sew the quarter units together to complete your “Morning Star” block!